There used to be a churrascaria near my house. 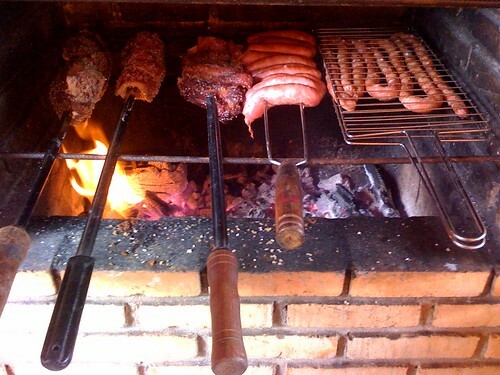 A churrascaria is a traditional Brazilian barbeque where diners are treated to a wide selection of meats, roasted on spits and carved at the table. On a busy night, there might be a dozen waiters, each carrying three skewers of beef, chicken, pork or lamb, scurrying from table to table. This particular churrascaria featured a useful device: a wooden block about the size and shape of a cardboard toilet paper tube. Alvaro’s simple instructions stuck with me and, over the years, I’ve found many useful applications for them. Being brave is not something that comes easily, especially in business, but the payoffs are enormous. People value honesty, but they also like being right. When you have a disagreement with a client, whether it’s philosophical in nature, or just a different interpretation of the scope of work, it might seem easier to bend or avoid the issue all together. Your value lies in your willingness to provide straightforward, unvarnished advice. There’s no substitute for laying it all out there in a way your clients can understand. You become more, not less, valuable when you do so. If you’re a consultant, your expertise is your product. You need to find a way to stand out. It’s easy to be all things to all people, but that approach won’t win you new clients. When it comes to your specialty, you must have a well-articulated point of view. Create a body of work in your blog, in your Twitterstream, and on your website that demonstrates that you have a perspective that is unique and valuable. And remember, if you’re not raising a few eyebrows, then you’re probably boring. And if you’re boring, nobody’s paying attention! Nobody wants to be a bore. We all want to believe that our accomplishments speak for themselves, but with everyone wrapped up in the day to day, you can’t just shuffle along assuming that people will notice how awesome you are. Tell your own story. Share experiences that have shaped who you are and that demonstrate your expertise. You can do it tastefully. Really, you can. Being a successful business owner requires passion, heart, and a whole bunch of courage. Hopefully, with Alvaro in your corner, you’ll start to notice even more ways that you can be brave every day. Ann Bevans is a writer, graphic designer and web developer. As principal of Ann Bevans Collective, she helps clients articulate messages that matter and create print and online marketing programs that communicate those messages with impact. Ann asks tough questions and doesn’t accept flimsy answers. She makes music and writes fiction. She does all her own stunts. Connect with Ann at www.annbevans.com, Twitter, LinkedIn, or Facebook.